The Urban Land Institute has just completed a study on ways to compete with Santa Monica and Venice to attract creative office users. For Culver City–work on parking, parking, parking and make it easy for developers to convert the warehouses to creative office (which means helping figuring out the parking). Culver City has a good inventory of mid century warehouses buildings which developers have converted into amazing creative space. Samitaur has supplied ground breaking architecture. That has been one of Culver City’s magnets. Move over, Silicon Beach: El Segundo wants in on the tech boom action. The Urban Land Institute just completed a study for the city that suggests ways it can develop its own creative office space hub that would compete with Santa Monica and Venice, where Google Inc. occupies more than 100,000 square feet and is looking for more space. The focus of the plan is the former industrial neighborhood known as Smoky Hollow, bounded by the Chevron oil refinery, Pacific Coast Highway and El Segundo’s downtown corridor. Urban Land Institute consultants conducted the study to help the city identify amenities and services it needs to provide to attract creative firms and become an incubator area for startups. The study, released last week, found that the neighborhood’s industrial feel, small midcentury buildings and beachside locale will be attractive to such firms. Building prices are also advantageous, coming in at least $325 a square foot cheaper than Santa Monica. But to be truly competitive, the city needs to increase its fiberoptic connections, add parking and amend its specific plan to encourage adaptive reuse, because creative companies seem to be attracted to a concrete-floor, bare-ceiling aesthetic. Map: The hottest spots in the U.S. for startup tech jobs – GeekWire–Los Angeles Continues to Lag. This article below from last year shows Los Angeles as low as number 10 as a hotspot for tech startups. This contrasts with the dot com boom where Los Angeles was a solid four. A lot depends on how one slices and dices data. When you look at Los Angeles Orange County as a region, it ranks number 3 to 5 in venture funding ( depending on the quarter) according to Money Tree Price Waterhouse. However, the rank falls perciptiously when you look at just software venture funding as this area is driving the urban tech boom. A recent article by Richard Florida put Los Angeles. An article by Richard Florida, published in the Atlantic Cities (June 13, 2013), America’s Leading Metros for Venture Capital, shows the Los Angeles Metropolitan Area as number 5. 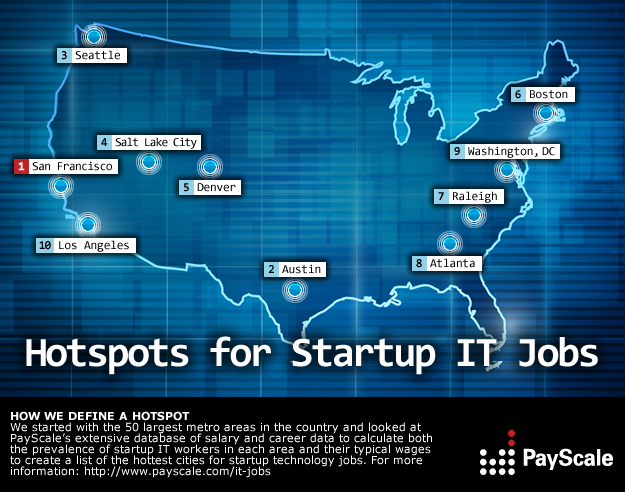 Map: The hottest spots in the U.S. for startup tech jobs – GeekWire. Maker Studios, a company that produces media content for the web, just signed a 50,000 square foot lease at 3562 Eastham Drive in Culver City. Maker Studios joins other recent media-for-the web content companies in the Hayden Tract. Several companies include Four Wall Studios, Mahalo, and Popsugar. The cluster of these firms gives rise to a small community that could encourage other firms in this emerging industry to also seek office space in Culver City. The success of these firms would also help create a new source of demand for Culver City creative space. These media-for-the web firms join other creative office companies in Culver City that include digital advertising, entertainment, old media, and software firms. A recent article from the Los Angeles Times discusses the success of Culver City and its challenges. The addition of 1100 parking spaces at the Washington and La Cienega Expo stations helped convince these firms to locate in Culver City. As some tech companies scale to 10 employees per 1000 square feet, the Expo line may provide one of the few ways for firms to help provide an alternative to parking to accommodate such density. Culver City has transformed into one of main areas on the Westside that many tech and media tenants have been drawn to for creative office space. In the second quarter of 2012, Culver City had a net absorption of 16,000 square feet, with the asking rates for Class A and Class B space remaining constant from the first and second quarters of 2012. In general, Los Angeles as a whole as well as West LA, are lagging behind other major cities in digital technology growth. However, one area that is booming here is digital advertising. This specific market is where Los Angeles, especially the Westside, has a dominant role in the this technology. A recent LA Times article was published that discussed this phenomenon. In the article, one of PMI’s tenants, Omelet, in Culver City was featured. However, in the same building, two other digital advertising firms reside in a three tenant building. See the Los Angeles Times article below from today. Digital advertising firms are built for the Internet age – latimes.com. Wheels.com’s All Electric Bike Enters The Last Mile Transportation Revolution Along with Dockless Bikes and Scooters .